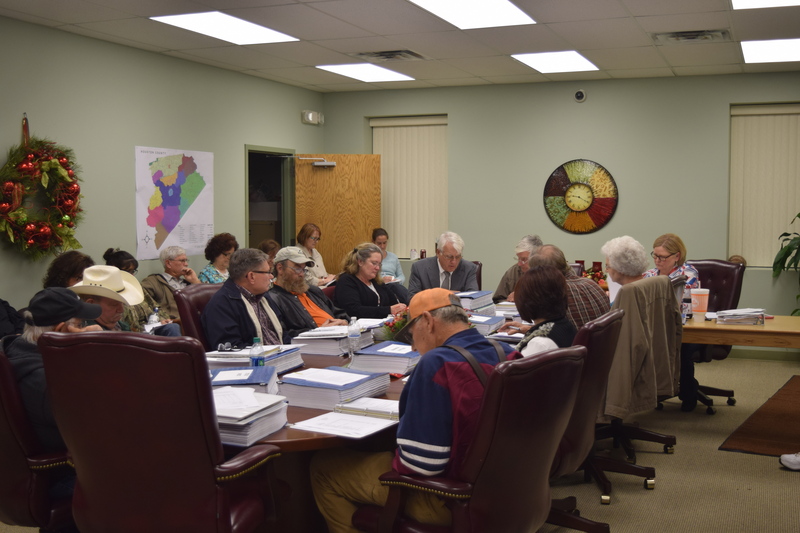 HOUSTON COUNTY – During the monthly meeting of the Consolidated Water Supply Corporation (CWSC) Board of Directors meeting held on Tuesday, Dec. 13, shareholders in the corporation wanted answers to questions which had been asked in previous meetings. In the first part of this article published last Sunday, it was described how several shareholders had called the accountability of the board into question during the public forum part of the meeting. The questions did not go away nor did the tension in the room dissipate when the CWSC Board retired into executive session at 6:42 p.m. In part two of this series, the immediate aftermath of that closed door session will be examined. No further discussion was held on Reed’s evaluation during the remainder of the meeting. The attorney then asked Reed if she would read from a prepared statement concerning questions pertaining to overtime pay and nepotism which were brought forward during the CWSC meeting held in November. “CWSC has paid a considerable amount of wages and overtime and the directors have encouraged the general manager to evaluate options to reduce this overtime,” Reed said. Prior to 2005, CWSC had checked its water plants three days a week but in that same year, the CWSC received a notice of violation from the Texas Commission on Environmental Quality (TCEQ). The notice instructed the corporation to check the plants and read the meters on a daily basis, Reed said. “During 2005 and 2008, CWSC checked the plants five days a week and estimated the usage on the weekends. The TCEQ issued a notice of violation which instructed CWSC to inspect the plants every day, including holidays,” Reed said. In response to the 2008 TCEQ violation, Reed said she brought the matter in front of the Board of Directors as to whether CWSC should hire three more operators, buy three more vehicles or pay existing employees the overtime. She said the board agreed to pay the existing employees the overtime instead of hiring more people and buying more vehicles. She added once the calculations had been done, it appeared the cost for overtime expenses was less than the cost to hire new personnel, provide benefits and purchase new vehicles. The next item addressed by Reed concerned allegations of nepotism at CWSC. “Two employees who hold licenses that are required to check the plants are related to the general manager. One was hired by the general manager in 2009, after it was discussed and the board was consulted. The other was hired by prior management,” she said. “The Board of Directors is reviewing and has reviewed the general manager’s response. The directors continue to review and evaluate the general manager’s performance in the management of CWSC,” Reed said. The general manager said the corporation could install a SCADA System but that would not eliminate the need to check the water plants on a daily basis. “SCADA” is an acronym for “supervisory control and data acquisition.” The SCADA system is essentially a distributed computer system used by operations and management for process monitoring and automation. As Reed continued, she said members of the CWSC had complained CWSC “… has employed members who are related to each other and to the general manager. The Board of Directors has adopted a policy to prohibit the hiring of a person who is related to an existing employee or member of the Board of Directors,” Reed said. In one specific instance, Reed said inquiries had been made about the employment of an employee’s spouse and added the couple was not married at the time the spouse was hired. Reed said she reported these hirings to the board and when the nepotism policy was implemented by CWSC, the policy did not require the employees to be discharged. Following the meeting’s adjournment at 10:15 p.m., Massengill was asked if he could comment on Reed’s evaluation. “No. No, I cannot. That I cannot do. It’s against the law,” he replied. When asked specifically if the review was positive or negative, Massengill declined to answer. In part three of this series, the unanswered questions of CWSC shareholders who requested to be placed on the agenda will be examined. Previous articleWhat Do a Cowboy, a Defunct Department Store and a Pair of Headlights Have in Common?